Blah, blah, life is busy-blah. Let's eat some candy! Thanks to this year's Peep and m&m releases, Neapolitan got it's moment in the sun. 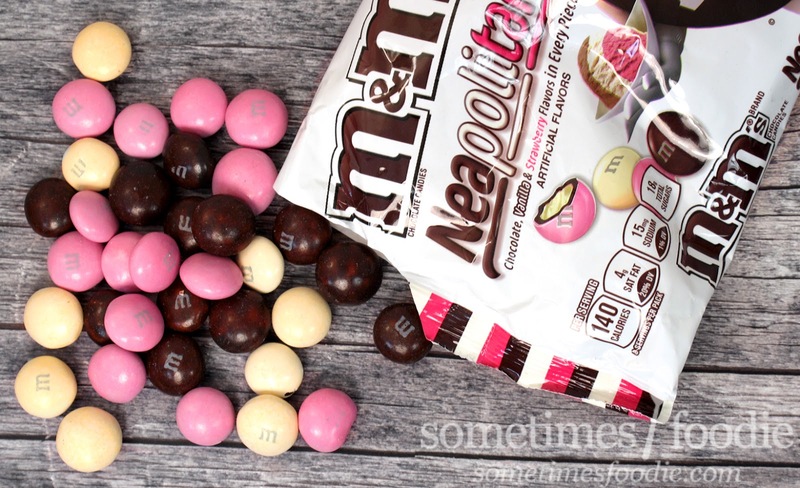 A classic mix of vanilla, chocolate and strawberry, now in candy form, what could go wrong? 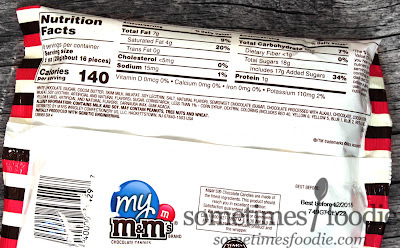 What we have here is the classic sac-o-potatoes-style bag of m&m's. It's made of a thin, shiny, plastic, which can be tricky to photograph without glare, and it isn't re-seal-able. Australia's bag was gusseted, so it stood up on it's own AND it was resealable. Australia, 1, USA 0. By comparison, these sac-bags just aren't as appealing, and this artwork isn't helping. 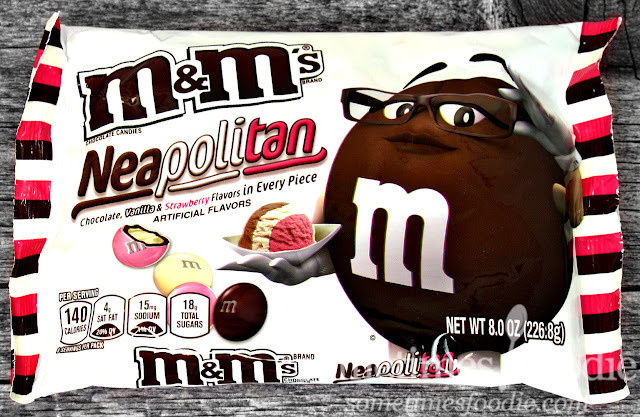 We have scattered candies against a stark white backdrop and the sassy Brown m&m is holding a CG scoop of ice cream. Visually, it's a sad affair, and the font they picked for the "Neapolitan" is just...awful. Why add a stroke to the other two colors? Just pick a neutral background color all three would shine against. Take a look at Australia's bag, and then look at ours. This is just sad. I think this is one of my least favorite bags they've ever designed, but I am hopeful that the candy inside will be more appealing. The Australian version used the small, classic, m&m size with smooth, perfect, ovate little candy pieces, each with their own flavor. American's? We went for the lumpy, imperfect, super-sized version of the candy we often see used for limited edition flavors. Instead of each color being it's own unique flavor, all three have been combined into one, layered, candy treat. 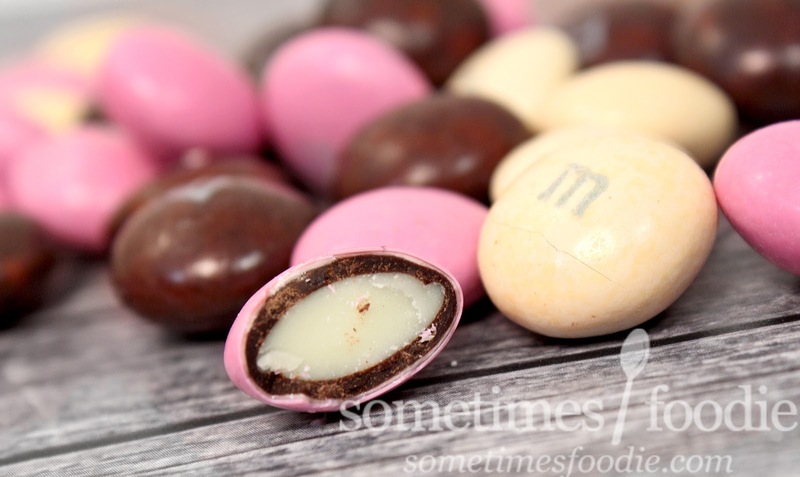 The candy shell is sweet and mild, like always, then we have a thin layer of chocolate, and a strawberry-vanilla flavored confectionery center. When eaten together, you can taste chocolate, and a creamy yogurt-like strawberry, but it's not as enjoyable as it sounds. The fake strawberry flavoring tastes like a mixture of Nesquik syrup and the same fake strawberry-yogurt used in Meiji Apollo (which I am also not a fan of). 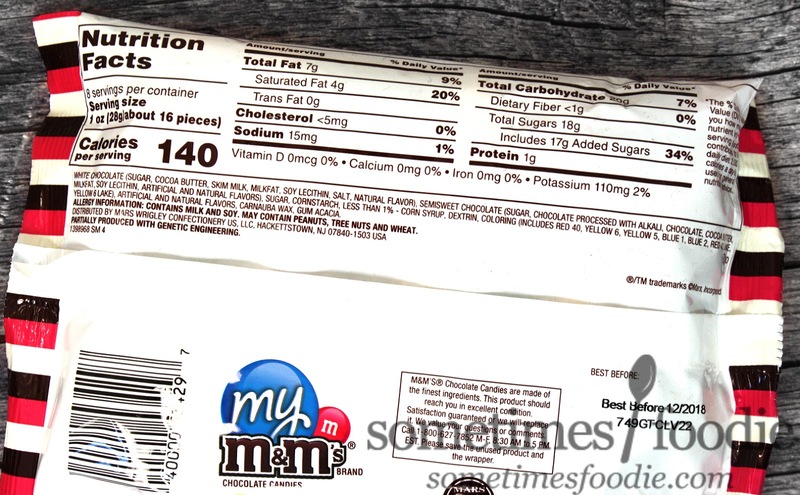 Thankfully the crunchy shell and the chocolate flavoring help to balance things out making it more tolerable as you snack, but once everything is swallowed and gone the tangy fake strawberry flavoring remains. I don't say this very often, but, yuck. My boyfriend's daughter had her birthday party last month, so I put these out on the dessert table to see what people thought without saying anything to see what their reactions were. The most interesting thing was that everyone though certain colors were a different flavor, with the pink being everyone's least favorite! Very interesting. Maybe the pink dye had something to do with it, but the power of suggestion seemed to be strong with this one. People seemed to pick out the brown and off-white ones for snacking, but these were far from a hit. We had 20 people over for the party, and the bowl was still half-full at the end of the night. I tried putting them out again at Easter, which had 22 people, and again...they survived the night. So it seems it isn't just me, this flavor is a definite flop. The tangy, fake, strawberry flavoring lingers long after the candy is gone, and it starts to feel like you ate some spoiled strawberry yogurt. If you really like Meiji Apollo and other artificial strawberry chocolate flavored snacks, you might enjoy this, but I think they're pretty awful, and the remaining picked over candies went right into the trash.